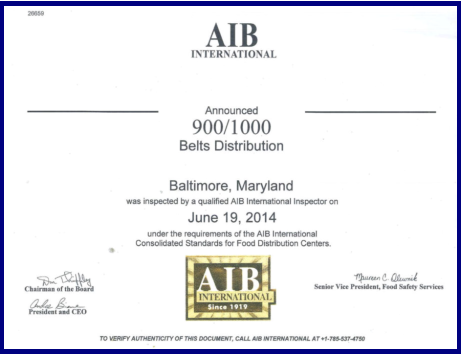 Belts has general purpose operating authority in both Foreign Trade Zones (FTZ) in the Maryland geographic area, Number 73 near Baltimore-Washington International Airport, and Number 74 in Baltimore City and nearby counties. FTZ Advantages for manufacturers and distributors include: • Duty deferral on imported products until shipment • Assembly of component parts within a Zone for shipment to U.S. markets at a lower "finished product" duty rate • Sampling, inspection testing or repair of imported products without duty payment • "Made in U.S.A." designation on products assembled or manufactured from imported components in a Zone • Duty deferral or resolution of quota problems within a Zone • Duty abatement on the destruction of waste products within a Zone • Sampling, inspection testing or repair of imported products without duty payment We are also one of the very few warehouses on the East Coast with Processing Authority in a Foreign Trade Zone, with many additional benefits to your company, including assembly and product manipulation in a tax free or deferred environment. BRC Global Standards (BRC) is a leading brand and consumer protection organization, used by over 25,000 certificated suppliers over 130 countries. BRC guarantees the standardization of quality, safety and operational criteria and ensure that manufacturers fulfill their legal obligations and provide protection for the end consumer. The Belt’s Corporation is extremely proud to hold a AA rating for storage and distribution. 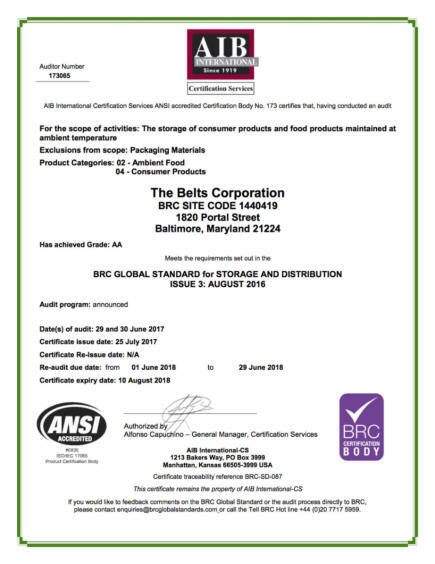 The American Institute of Baking or AIB is a third-party audit service commonly recognized for its certification program of food grade warehousing. AIB’s food safety and hygiene audit services are recognized worldwide as the standard against which other food safety programs are judged. 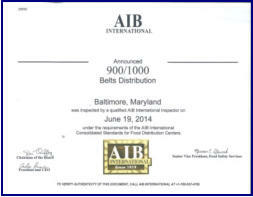 The Belt’s Corporation recently achieved a 990 /1000 rating for storage and distribution. Cross-docking is a practice in logistics of unloading materials from an incoming semi-trailer truck and loading these materials directly into outbound trucks or trailers with little or no storage in between. 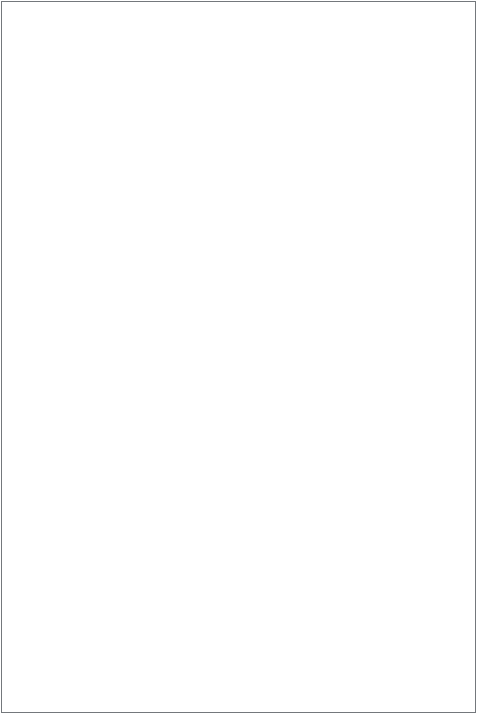 Belts has been successfully running, and constantly improving, cross-dock warehousing for decades. Cross-docking freight allows us to sort incoming freight to different destinations, or combine product to one final destination. This practice gets your product to market faster, and reduces costs by using less warehouse space and less labor. Cross-docking is especially beneficial for businesses that need a heavy volume moved quickly and accurately. 1820 PORTAL STREET BALTIMORE, MD 21224 171,000 + sq. ft. masonry, 20 ft. clear ceiling height, distribution facility, with heavy power, located just 1.2 miles from the Port of Baltimore’s Seagirt Terminal. This property is located in Foreign Trade Zone (FTZ) #74. 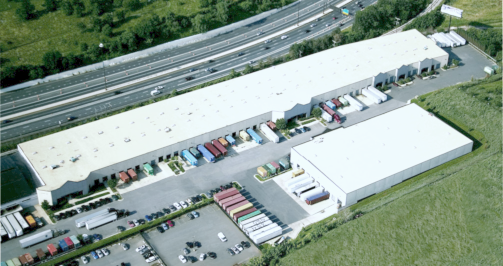 With locations strategically located near the Port of Baltimore and the Baltimore Washington International Airport (BWI) , we can assist your Company in improving your distribution needs , better manage your inventory and reduce your warehouse and storage costs. 600-608 FOLCROFT STREET BALTIMORE, MD 21224 205,000 sq. ft high cube distribution center. Belt’s operates the U.S. Customs Centralized Examination Station for the Port of Baltimore at this facility, and the U.S. FDA has offices in the building. 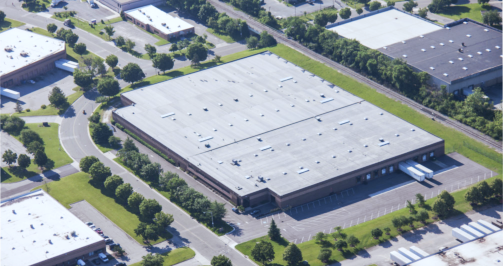 The facility is also home of Belts Transportation Services, Inc. and is located in Foreign Trade Zone (FTZ) #74.